Egypt honeymoon package offers you a wonderful classic and romantic adventure tour in Egypt. Here you will have a great honeymoon in an authentic Egyptian style. Our Egypt honeymoon package offers you a chance to tour Egypt and discover ancient and modern attractions in various cities. Later sail along the Nile in a luxury Nile cruise. All these will make your honeymoon a remarkable experience. 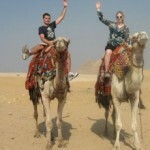 Egypt Honeymoons Tours and all-inclusive honeymoons , Honeymoon Nile Tour in Egypt. A romantic honeymoon tour. Egypt Honeymoon Package : Weddings in Egypt, Egypt Luxury Honeymoon tour package vacations. you to your hotel. During your transfer, your tour leader will provide very helpful information so that your trip is the best it can be and then you have the opportunity to ask any questions. Enjoy a good night?s rest at one of the top quality hotels and prepare for your adventure to begin. In the hotel you will find flowers and Egyptian red winde as courtesy of Ramses Tour. After breakfast you will start your first adventure with Ramses Tours. – Visit the great pyramids of Cheops, Chefren, Mykerinus, Sphinx and it?s valley temple. – Visit the Egyptian Museum and be amazed with the treasures of Tutankhamen. – In the evening you have the choice of either going for sound and light show in Giza or nile cruise in cairo with belly dancing and oriental show. – At early morning, you will get transfered to Cairo airport to take your flight to Aswan. In Aswan airport, your guide will meet you and transfer you to check in in your Nile cruise. Aftewards, you will start your Aswan day tour with a visit to the High Dam and the Unfinished Obelisk Then you will explore the pretty Temple of Philae. Return to your cruise and overnight in Cruise. – Visit Edfu Temple, which is dedicated to Horus at Edfu. – Proceed onto the Colossi of Memnon. In the evening, you will have a traditional wedding zafa in Luxor (procession that will resemble an Arabian/Egyptian wedding party) with a troupe of dancers and musicians dressed with the Egyptian typical clothes, welcoming you by singing and dancing Egyptian Folklore. – Accommodation at all hotels on bed & breakfast basis. 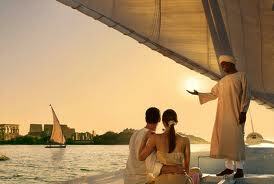 – Accommodation on 5 star Nile Cruise which is Full Board. – Train Ticket Aswan to Cairo. – All service charges and taxes.